It was fashionable, in the 1930s, to talk about the darkness spreading across Europe. It wasn’t just Hitler and Mussolini. 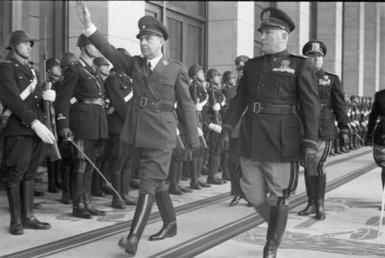 Franco of course came to power in Spain with his Catholic fascism. Movements spread up all over the continent, like the Ustase in Croatia with their leader Ante Pavelić, or the Arrow-Cross party in Hungary (which was one of many fascist movements). It was a cloud that spread, and touched everywhere. No country was free of its pro-Nazi or otherwise fascistic movements, including the UK, where Oswald Mosley was nearly Prime Minister, and would have been allied with Hitler. Well gang, happy days are here again! I don’t want to bandy about the word “fascism”, even when I think it fits. But with the election of Trump, the world’s far-right racial movements have a new energy. And the Trump campaign is set to take advantage of that, and lead it. Nigel Farage, the sinisterly oafish leader of UKIP, was the first international politicians to meet with Trump after his election, where they talked about “freedom and winning“, like smart grown-ups do. Stephen Bannon, the racist right-wing head of Breitbart, and now Trump senior counsel, is already working with Marine Le Pen in France, the leader of the far-right nationalist front. The anti-immigrant racial rightists in Russia and Hungary are extremely energized. What do these have in common? Not too much, when you get right down to it. After all, one of the UKIP’s primary slogans was protecting the National Institute of Health. The Le Pens are not climate change deniers. Putin isn’t a proponent of supply-side economics. This isn’t, in any way, a conservative coalition. It’s entirely anti-immigrant white nationalism, or white supranationalism. I don’t know the form it will take, but it will be ugly. It’s tragic and ironic that all of these people are running against the forces of globalization, but are enacting a globalist movement of their own. It’s one that rejects modernity, but is no less enabled by modern communication and modern idea of connectedness for it. It’s just a different angle on the globalist project: a far more terrifying, cruel, and revanchist one. That’s the world we’re in now. This entry was posted in Foreign Affairs, Uncategorized and tagged supranationalism. Bookmark the permalink.